Pest Preview – Is that a rat or a squirrel I can hear in the loft? Very divisive subject controlling squirrels as many see them as welcome visitors to their gardens feeding and nurturing them. 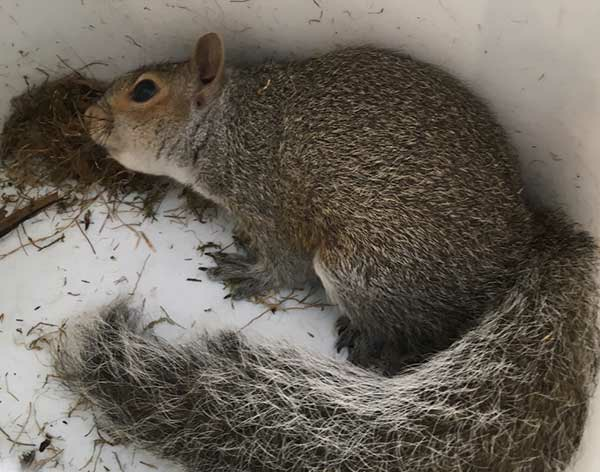 TP Pest Control Services treat all animals humanely, our discreet service and sympathetic approach to others feelings makes us the number one choice for Squirrel Control in Dorset. TP Pest Control Services are Borough of Poole Trading Standards Approved and offer no obligation site surveys which are completely FREE of charge. The site survey will allow us to determine if a humane fencing option or use of deterrents can be used before any humane live capture traps are thought about. TP Pest Control Services offers a complete squirrel control service with proofing, deterrents and humane traps if needed. We have over 30 years experience in Professional Squirrel Control throughout Dorset and the surrounding areas and will always use environmentally aware solutions where possible. After its deliberate introduction to the UK from North America in 1876, the grey squirrel has all but pushed our native Red Squirrel to the brink of extinction. The Red and Grey Squirrel can be mistaken in winter months as the Red Squirrel will show some grey on its back. However the Red Squirrel is protected under the Wildlife and Countryside Act 1981. Average adult weight is around 480 grams with a body height of 26cm and a tail length averaging 20cm. Grey Squirrels are true rodents having the classic two front incisors growing throughout its life and a diastema (gap where other mammals have canines and pre-molars). Being a urban resident it is not uncommon to see them wherever houses are close to trees, parks and woodland. Noises in the loft and cavities can be confused with rats and mice especially in the winter months as they look for warmer opportunities to make their nests (dreys). Causing untold damage to electrical cables leading to fires the cost of eradication and proofing soon justifies the expense. With two breeding seasons a year the first young are born between February and March after a pregnancy lasting just short of 7 weeks. The young are then weaned at 9 weeks, the second litter arriving between August and September. Litter sizes can range from one to six. The young are then capable of breeding themselves between six and eight months of age. The average lifespan is six years however in captivity they are capable of living up to 20 years. TP Pest Control Services takes seriously its responsibility in the protection of children, pets, wildlife and the environment. All control methods will be discussed after we have carried out a thorough inspection. There may well be an immediate proofing or hygiene solution which can help us gain control. Call us today and we will endeavour to have a qualified friendly technician with you within a few hours.